When we ordered the new computers for the lab we ordered energy efficient computers. 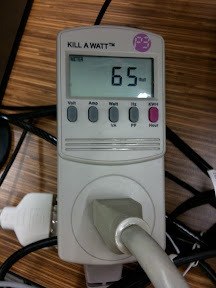 Despite being more capable, our new Dell Optiplex 760 computers use only 64 watts of electricity, compared to 92 watts for the old computers. So despite increasing the number of lab computers from 25 to 33, we are using less electricity than before! This week we have implemented a new system that shuts down all the lab and quick station computers every night at 10:20PM (except Friday nights). Shutting down the computers at night will reduce the amount of carbon emitted to power our lab from 22 tons to 13 tons per year! Our actual carbon emissions will probably be closer to 8 tons per year because the computers will be turned on in the morning only when they are needed by students (lab computer usage is quite light during the summer months). This also translates into reduction in our power bill by just over $1000 per year. To put the computer lab numbers into context, my home which uses a heat pump to keep it warm, an electric hot water tank to warm water, an electric dryer to dry our cloths and an electric stove to do our cooking, uses about 35 Kilowatt hours per day in the month of February (this will go down quite a bit in the summer months). The computer lab was using 65 Kilowatt hours per day before these changes, and going forward will use about 23 Kilowatt hours per day! A win for the environment and a win for the budget. If you have any questions or concerns please let me know. For more details, you can look at the following details to see how the carbon calculations were made: http://is.gd/8K6hX A big thanks to Serena for reminding me that this was something I needed to do (after being on my todo list for over 2 years).